Joseph Pecoraro has made some major improvements to Web Inspector. It is now much easier to create and much around with the content. Create new CSS selectors with ease; Add content in-line with elements; see color representations of any value. Who counts “1?, “11?, “12?, “2?, “3?, etc. Certainly nobody I know! So, I implemented a variant of the alphanumerical sorting algorithm for properties when they are displayed in the console. Now you get a much more natural ordering! JSON and CSS syntax highlighting is now there. These are some great noew features. Especially the event listener viewer. 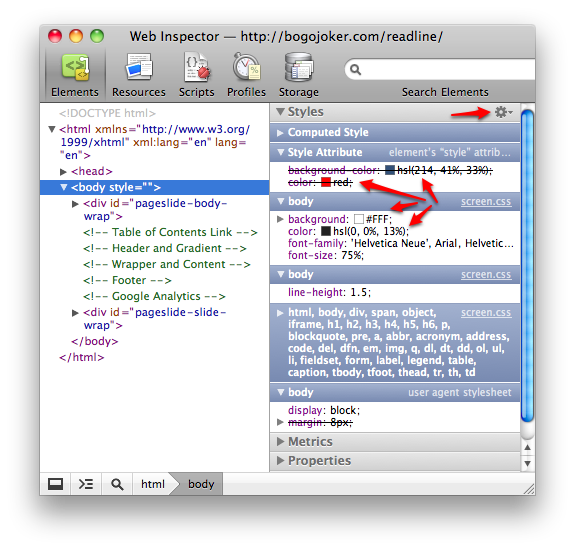 It’s great to see the Web Inspector continue to get some love. It’s nice to know that they aren’t resting on their “almost good enough Firebug equivalent” laurels. I am continually impressed with the WebKit team no matter what they are up to.